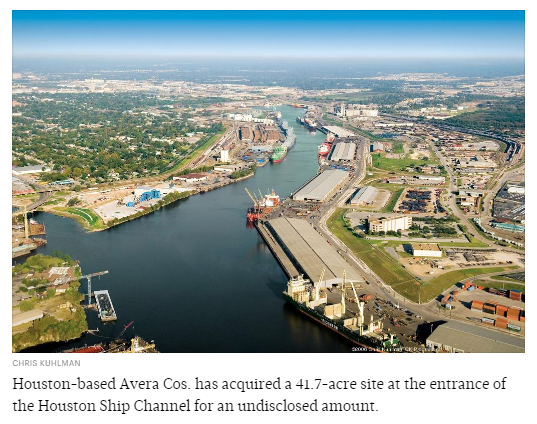 ​​​HOUSTON - Avera Cos. has acquired a 41.7-acre site at the entrance of the Houston Ship Channel. The property, called HMS 850, is near the San Jacinto Battleground state historic site and both Barbours Cut and Bayport container terminals. The site’s existing permits create four distinct lease areas: barge terminal and fleeting area, dredge material Placement area, potential reclaimed land, and future fuel and terminal distribution facility. Kirby Inland Marine, a division of Kirby Corp., will be the first tenant at HMS 850, utilizing an area approximately 700 feet by 2,000 feet to provide mooring for 76 barges. The acquisition will allow Avera to “help accommodate the rapidly increasing need for barge fleeting and deep water terminal space,” Avera President and CEO Trey Odom said in a statement. “The existing permits at HMS 850 enable an otherwise ordinary site to function as a critical component of industrial activity at the Houston Ship Channel.